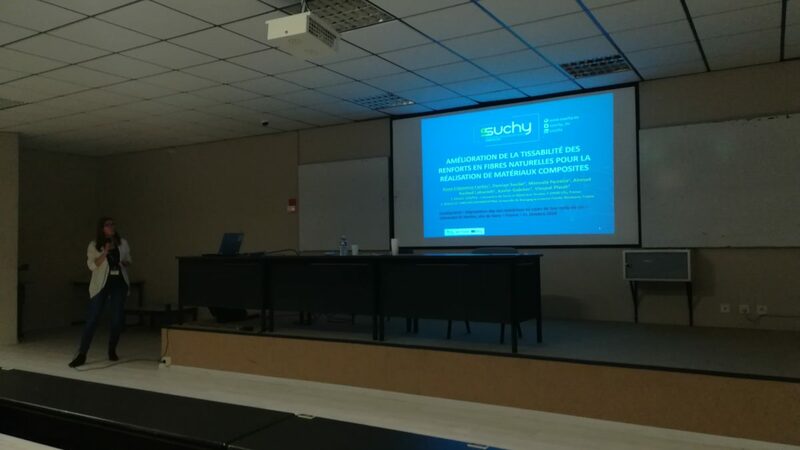 UFC (University of Franche-Comté) and ENSAIT (Ecole Nationale Supérieure des Arts et Industries textiles) joint work on SSUCHY Project has been presented during the Ecomat 2018 Conference in Nantes on October 12, 2018. Ecomaterials are bio-based composite materials with moderate environmental impacts. They are more and more used in the fields of building, transport, yachting, etc. However, the use of natural resources in their formulation (fibers, aggregates, biopolymers) modifies their resistance to aging and consequently their lifespan compared to synthetic systems. The objective of the conference is to bring together all current academic knowledge and feedback from industry on the sustainability of these materials in the following areas: Building, transport, boating, energy, sports, etc. Thus the focus is on describing the phenomena related to the degradation of these materials on each stage of the life cycle. Nowadays, natural fibers are more and more used in composite applications due to the growing interest for environmental concerns. Some natural fibers, such as flax and hemp fibers, have good specific mechanical properties, thanks to their low densities, and good thermal and acoustic insulation properties. Moreover, they are bio-based, renewable, biodegradable and harmless for human health, in comparison to the man-made technical fibers traditionally used for composite applications. The variability of natural fibers (chemical composition, morphological and physical properties), referred to plants, environmental conditions and defects, is still an obstacle to their wide use in structural composite applications. Contrary to the man-made technical fibers, which are extruded into filaments of very long length (continuous), the natural fibers are short or long staple fiber (discontinuous) and need to be assembled together by spinning process to form yarns which are used for the next textile reinforcement manufacturing stage. By spinning process, fiber strands are attenuated to obtain the required linear density and twisted together to obtain the necessary cohesion between fibers to sustain the stresses applied during the next manufacturing processes. Thus the level of the inserted twist to the fiber strand during spinning process is associated to the fiber strand linear density. For a roving having a high linear density, low twist level will be sufficient to obtain the necessary cohesion. Whilst for a yarn, which is thinner and holding less fiber at its cross-section compared to a roving, a higher twist level is required. Otherwise, the inserted twist decreases yarn diameter and make its structure more compact, as visible on Figure 1. Consequently, resin impregnation for a yarn with high twist level is more difficult compared to a flat roving. After spinning, weaving process is widely used to manufacture a 2D flat textile preform thanks to its high productivity and low manufacturing cost. Yarns have to be strong enough to sustain loads induced during this manufacturing step: in preparation stage for the production of warp beam and in weaving stage, which put a lot of strains on yarns. For yarns made of natural fibers, the required strength is brought currently by twisting or by chemical treatment. These techniques permit reducing yarn breakage during weaving and increasing production rate. This results in reduction of energy consumption and waste production and thus decreasing the environmental impact of the reinforcement manufacturing step. Another way to improve roving strength, which is more environmental friendly, is to produce commingled yarns. Like this, roving of natural fiber is wrapped with a bio-based thermoplastic polymer yarn that protects the roving surface and gives it the required strength. After weaving, composite pieces can be directly manufactured using a compression molding process by melting the thermoplastic yarn under specified pressure and temperature. Thus there is no need for resin infusion step. Natural fibers are also sensitive to moisture absorption. Moisture content can affect their mechanical properties and the impregnation process with the matrix. Chemical treatments can be used to improve cohesion between fibers and to decrease their hydrophilicity for a better impregnation, but this treatment generally affects the internal structure of fibers, and their properties. Thus, the manufacturing of a bio-sourced composite material from natural fibers is a multistage process and the fiber passes in different forms; roving, yarn and fabric before impregnation. At each stage different processing techniques can be employed to improve the process efficiency but they can be harmful for the next stages and damaging the mechanical properties and performance of the final composite. Therefore conducting a multiscale analysis is necessary to identify the optimal parameters with efficient performance and without deteriorate the mechanical properties of fibers and composite. In the present study a multi-scale analysis is performed for the manufacturing of bio-sourced composite made of flax and hemp yarns and rovings woven into a 2D fabric using a manual dobby loom. Textile and mechanical properties are characterized at each scale in order to evaluate the impact of each fabrication stages on the final composite. 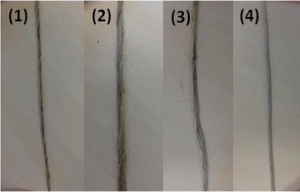 This kind of study highlights, for example, the degradation of yarns elasticity due to cycling loads caused by shedding and weft insertion during weaving process. This degradation is evaluated by fatigue tensile tests. Otherwise, the influence of environmental conditions such as the humidity and water absorption for flax and hemp fiber is also studied. High humidity level is often applied in spinning and weaving workshops to improve process efficiency. However, water absorption affects both mechanical and textiles properties of these natural fibers. Consequently, the performed analysis permits to study and improve the weaving process and thus to produce reinforcements with optimized properties which fits well with composite materials requirements. Acknowledgments: authors would like to thank the Company Linificio e Canapificio Nazionale (LCN) from Italy for providing the flax yarns and rovings used in this study. This project has received funding from the Bio Based Industries Joint Undertaking under the European Union’s Horizon 2020 research and innovation program under grant agreement No 744349 – SSUCHY project.